This was my fourth year visiting the Gateshead Jazz Festival, which has quickly become one of my favourite trips. It's partly the venue – the Sage Gateshead holds four different performance spaces inside the one building; there's a short walk or shuttle bus into Newcastle Town Centre, and next door is the Baltic Arts Gallery. But of course it's mostly the music. Gateshead manages to tread that difficult line between the popular and the innovative. There are the big concerts to fill the large main hall by bands like Clare Teal and her Hollywood Orchestra, GoGo Penguin, and a big Jazz Africa/Jazz Cuba Triple Bill. There are top quality European artists in the second hall and I don't think any other UK festival would risk centring it's programme around the avant-garde Dutch Instant Composers Pool (ICP) who did a concert, a talk, a family concert, a film, a photo exhibition and a workshop over the weekend. More of that later. As with most festivals it's impossible to see everything because events clash, often four at the same time, so I can only report on the bits I got to see. What was interesting was that there were a number of themes running through the festival and I picked three to focus on. 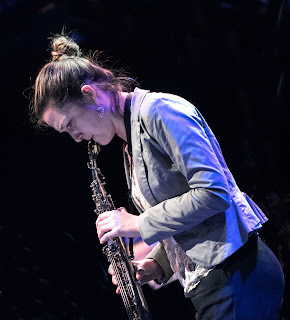 British female instrumentalists was a welcome feature – with Laura Jurd, Nikki Iles and Trish Clowes all prominent on the main stages, and many more appearing on the free stage. Modern European Jazz was another including three National youth orchestras from UK, Holland (outstanding) and Germany. And then there were the more established Europeans with Daniel Herskedal and Tomasz Stanko. However the highlight for me, and a gig I'll remember for a long time, was the spectacular double bill that featured the veteran Dutch ICP Orchestra alongside the young Paris based Garibaldi Plop. 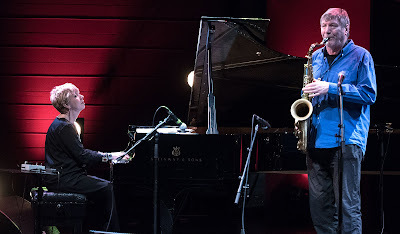 Both bands recently performed separately at the Vortex to rave reviews, and together here we saw an evening of fierce improvisation and witty experimentation that was exhilarating to watch. The show was preceded by an equally entertaining, often absurdist conference talk in which the 75th birthday boy Han Bennink dominated the proceedings. The third, and in some ways the most important focus of the festival was on the free stage. It's an important part of this festival, in part because it can attract new audiences and also because it offers a taste of what's on in the main venues. Set in the centre of the spectacular Sage Atrium it runs throughout the weekend and it's programming is much more interesting than might be expected. There's a lot of young local talent, there's big stars – programmed by Radio 3 on the Saturday, and some more established local bands programmed by the adventurous jazz north-east on Sunday. The free stage was always crowded as audiences listened to the delicate duets of Nikki Iles and Stan Sulzmann with equal attention to the young local power trios and the Sage students. Elsewhere I enjoyed Binker and Moses who had delivered a ferocious set on the Friday Night in a bill alongside the electronic thrashing of the Strobes – but then toned it down just the right amount for the free stage on Saturday. The only disappointment for me was Miles Mosley who seemed to have a fine band but an over-amplified bass – none of which seemed to bother the rest of the audience who loved every minute. Gateshead is a terrific festival with something for everyone, lets hope it goes on to even greater things in 2018.